A report on the effects of the crisis, cuts, restructuring and possibilities for struggle in Hackney, east London. The following text is work in progress in two regards, firstly in its attempt to capture some of the concrete impacts of the crisis on a local level, secondly to provide more general analysis of the class structure in Hackney for the debate of future local political activities. Therefore the summarising question would be: How do the cuts actually change proletarian conditions, what is the current internal constitution of the local working class and how could a political collective relate to it strategically and in a practical manner? Main problem for us to answer these questions is that up till now we have seen the cuts primarily 'on the monetary announcement'-level, but we have little insight into how these cuts trickle down into neighbourhoods, benefit offices, work-places, what kind of material changes they cause on the way and what kind of conflicts they engender. Without this kind of insight the protest will remain on a superficial level of public moaning about the government's policies. Hackney in North-East London borders the City and financial districts in the south, a middle-class dominated area in the west and mainly proletarian areas in north and east. Around 220,000 people live in Hackney, the area is densely populated, a large share of estate-type houses. The borough is dominated by migrant working class, the unemployment is above average, around 11 per cent. 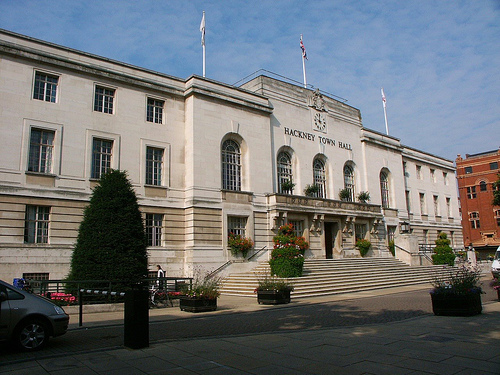 The public sector is the biggest single employer in Hackney, around 23,000 people work in the sector. Large workers' concentrations are Homerton Hospital, Hackney College, Hackney Waste Depot, various medium-sized call centres and supermarkets. There is a significant commuting community of workers, better paid council workers tend to live outside of Hackney and commute to work, while many workers living in Hackney work in London centre. Hackney is the most deprived borough in London 1 and is second only to Liverpool as the most deprived in the country. Inner London remains the most unequal part of the country with a fifth of its residents amongst the richest tenth of households in the country 2. Given the proximity to the City gentrification is rampant. The internal class divisions between 'lumpen-ised' unemployed and low paid service workers on one side, and middle-waged semi-executive office workers on the other, is blatant. With the crisis this personal dimension of class hierarchies is increasing. A large share of the local work-force caters for others, e.g. as restaurant workers, private care takers, cleaners. The wider reproduction is organised by mainly public sector workers with a permanent status, who form the middle-income-strata of working class together with and a large amount of workers in small-scale industries like print-shops, food-processing, courier-services, design or architect offices etc.. This 'productive' archipelago has still to be examined. The differences to not only express themselves in wage differences - and the ability to command other people's labour, but also in terms of housing and property ownership. Housing is one of the major issues in Hackney. The rate of house ownership is one of the lowest in the UK, only about 30 per cent of people own their houses, while the share of people who claim housing benefit is extremely high, around 40 per cent of all households. Nearly 25 per cent of these claiming households live in privately rented houses - another expression of the internal class division in Hackney. Hackney has the highest level of empty houses in London; 2,566 homes empty for more than six months. At the same time the borough has a high level of overcrowded flats; 10 per cent of houses are overcrowded compared to 2.5 nationally. Around 15,500 people are on the council housing list and 2,000 people are officially homeless. The policy of the local state is to neglect social housing maintenance in order to soften people for private re-development. The poverty-management is obvious, a lot of social control schemes, neighbourhood-police, community-pay back gangs of young convicts sweeping streets. Reports of gang-crime, stabbings and shootings are proliferated together with the introduction of new policing measures. But the combination of 'cuts in reproduction costs' and 'social control' is not enough. Obviously a major task for the state is to combine low-cost poverty and workfare-management with an upgrading of living areas attractive for real estate investment. These are the two poles to mobilise and synchronise a combined local work-force: managing and administrative workers and a bottom segment of low-waged reproductive workers. The grease for this re-structuring is from down the road, from the City. The geographical proximity between one of the world's most important financial districts and one of Western Europe's poorest neighbourhoods has its impact. Boom money from the Global South is presented as 'benefits' to the metropolitan 'southern' urban poor. These 'poles of tension' between both ends of Kingsland Road do not only require the mediation via budget and taxation policies, but through an army of 'social work', partly community based, partly outside the official government sector. Parts of the 'use-value side' of the large public sector employment have to be seen in these political terms. There are several large scale re-structuring projects which will impact on the local class composition, e.g. rail-connections between City and Dalston, which has made the area more attractive for middle-strata commuting. Two of the main projects are the Olympic Games Site and the re-development of the large housing estates in Woodberry Down. The Olympic Site 3 is a counter-cyclic investment. The major construction project has changed the landscape in the east of Hackney, formerly dominated by work-shop and ware-house economy and working-class dwellings. Currently thousands of multi-national building workers are engaged to set up the infrastructure for an event, which will create short-term revenue from the advertisement-industry and real estate market: since winning the Olympics bid house prices in Homerton are up by 69 per cent and up by 53 per cent in Shoreditch compared to the 36 per cent London average. We will have to analyse the impact of the Olympic Games on the local labour market. There will be a boost in service jobs like cleaning, security etc. at a time when the budget cuts will create redundancy pressure in the wider local sphere. The local job centres will become a interface between the short-term demand and increased unemployment of formerly guaranteed jobs - they will have to create a dynamic relation between the two. Woodbery Down is one of the biggest housing estates in Hackney, around 2,500 flats. It is an example of the link between global crisis and local conditions. The estate was Europe's biggest slum-relocation project after the Second World War. Since the 1990s it has been run down systematically. In the 2000s during the real estate boom the plan was to demolish the existing stock and build 4,800 new homes, out of which 2,125 are supposed to be affordable homes - meaning also homes with shared ownership - and 2,175 for sale. The local state argued that the homes 'for sale' will finance the social housing, "because the central government will not spend extra money". In January 2005 they announced that the whole construction will be completed by January 2008. Re-housing began in 2004 - but so far no new homes have been finished. Many flats are empty - some are occupied by 'temporary tenants' sent from other councils. The main developer Berkley Homes has been hit severely by the current crisis, shares have been down by 50 percent after the slump October 2008. The Dubai crisis also affected one of the main investors. Another major shift in local employment is going to happen once Hackney Council will take back some the formerly outsourced work. This will affect workers in the housing estate maintenance and the recycling department. Outsourcing made financial sense during the era of cheap money and 'start-up miracles' - we will have to see how the shift of hundreds of workers from the private to the public sector will be managed and mediated - what kind of claims the workers might develop. At this point of time we are only able to give a brief overview on the current planned cuts by Hackney Council. We will have to follow up the consequent results on the work-place and neighbourhood level. * School Support Staff: teaching assistants, learning mentors and nursery nurses are being cut back with restructures at Colvestone, Burbage, Grazebrook, Downsview and Ickburgh school. * Jobs and courses are under threat at Hackney College. * Subsidised nursery places have been cut from 300 to 60. * NHS redundancies as the Hackney Primary Care Trust looks to make 'efficiency savings' and privatisation. Cuts of up to 187 million over next three years in Hackney NHS; Homerton Hospital might shut down Accident and Emergency, Stroke and Maternity Department, replaced by smaller GP units, polyclinics. * Housing Needs services is being cut back meaning there will be less staff to assist the homeless and those in temporary accommodation. We cannot assess the political impact of these cuts. While there are tendencies of fragmentation and outsourcing regarding hospitals and colleges there is the opposite trend in the estate and waste management department. The only clear thing so far is that the cuts are not a pure attack on 'jobs and wages', but a re-structuring of the reproductive and policing function of the local state. A lot of programs targeted by the cuts are low-level social services which 'advise' or 'support' the poor: migrant advice, teaching assistants, community schemes etc. The cuts will leave 'social gaps' which will have to be filled and mediated - here an uncritical philanthropist left is predestined to become better social managers. Some of the experiences of the left in Hackney confirm this premonition -see below. Apart from general participation during national conflicts, like for example the strike at Royal Mail, there have not been many open struggles in Hackney recently. The crisis is opening gaps, on a general level of political management and within the social fabric and social management of the reproduction of the working class. The left response to the crisis has been both 'political' and 'apolitical' in negative terms, playing their parts as mediators in these emerging 'social gaps'. One part of the left acts 'politically' by trying to pressurise the council to change the course of the cuts, to form alliances with opposition parties, e.g. around the Labour MP Diane Abbott, to formulate alternative taxation or budget schemes. The other part of the left reacts 'apolitical' by organising around social issues, such as homelessness, migrant support, child care provision - neglecting a political perspective of the function of state services or the material base of class power and collectivity. In the current social situation of crisis these initiatives run danger to become instrumentalised by the state as 'conflict-alarm-systems' and in order to smooth over the blips, which emerge due to lack of funding for the urban poor. We see the following examples as part of self-critical reflection, given our own involvement in most of them. * debate of the class struggle tendencies of existing left activities and how to support them practically, e.g. unemployed workers initiative, squatting etc. * strategic discussion about central points of proletarian convergence in the area, e.g. central work-places, social spaces etc. The challenge will be to organise practically against the crisis attacks and to organise a debate about the 'character of social reproduction' within the struggle: to find a new language to criticise state institutions and urban alienation on the background of concrete workers' experiences. * Who are the main employers, or sectors people work in? * Where have the most recent investments been? * How significant is unemployment and the social consequences? * How significant is the migrant population and who constitutes it? * How significant is the university and student world? * Who is local government, have there been changes recently? * What kind of general impact of recession can you make out? * Have there been public sector cuts, or have any been announced? * Who is concretely affected by the cuts? * How did they 'sell' the cuts and how did affected people react? * Have there been job cuts or company closures? Where and how? * Has there been an increase in social control measures, workfare programs or other state measures to control social reproduction? * Has there been changes in housing, gentrification recently? * Is there a 'socially present' working class and/or history of struggle? * What have been the most important 'social struggles' in recent years? * What about the structure and social presence of the unions? * Who constitutes 'the left' in your town'? Has this changed over the last two years? * What are the main activities of the left? Are there new tendencies or initiatives in last two years? * Are there local newspapers or open meetings of the left? * Have there been mobilisations of the left or the unions against the cuts or other crisis impacts? How did that go? Who came? How do these 'alliances against the cuts' relate practically to the local working class? * Are there social-cultural activities, such as squatting, DIY concerts etc.? Have they changed during recent years? * Where do you work or study? * Are you active in 'social-political sense'? (Work-place, tenants association etc.)? * What were your own political efforts and experiences in the last two years? * What would you focus you activities on in future? * How could a 'wider coordination' or 'publication' be helpful? * What do you hope to take back home from this conference? Hackney is the most deprived borough in London and is second only to Liverpool as the most deprived in the country. The internal class divisions between 'lumpen-ised' unemployed and low paid service workers on one side, and middle-waged semi-executive office workers on the other, is blatant. 'Hackney Unites' are doing some upcoming sessions locally on workplace rights and organising. A colleague from work might be going and I'll pop along too, but I know next to nothing about them.